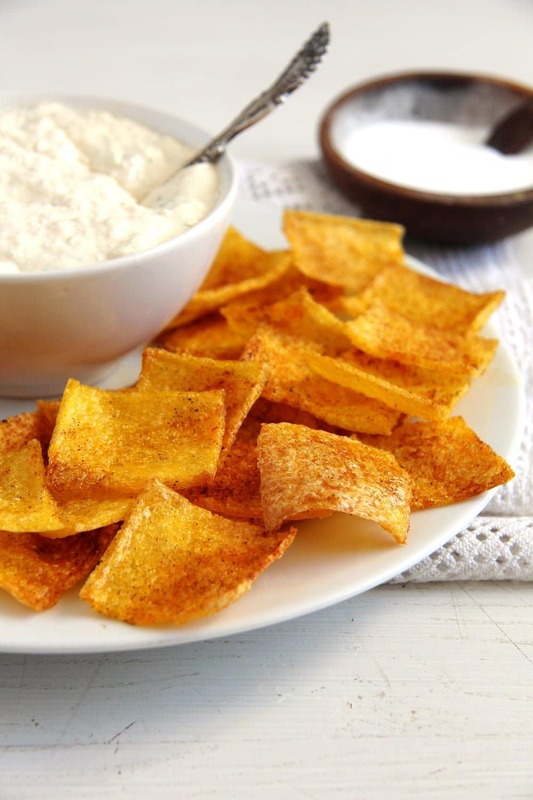 Crispy, spicy, low-fat, gluten-free and utterly delicious homemade polenta chips. 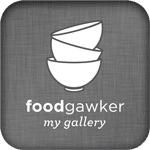 If you make polenta regularly you might have noticed the crust that remains on the bottom and the walls of your pot after you have eaten the polenta. If you don’t clean your pot immediately, the crust will dry out and you will get what my kids like to call polenta chips. They both like to eat the polenta, especially my son, who could eat plain polenta with cheese at least once a week, but, when the meal is over, they are really fighting over these so called polenta chips, that keep on hanging at the bottom of the pot. I remember myself as a child eating those dry polenta leftovers, it was my grandfather who gave me those pieces for the first time and I suppose that we always ate those rests together. It is one of those memories that will stay with me forever, a moment in time, just an image of my grandfather and me sitting at the table, looking into the pot and breaking out those crunchy, rounded polenta chips. No idea what happened before or after this moment, it is only this image that stayed with me for all these years, must be over thirty years now, I was still in kindergarten at the time. So, that gave me the idea of making real polenta chips, better tasting and in a larger quantity, to satisfy both my children and to stop them from fighting over those dried out polenta rests. I googled polenta chips (in Romanian) and it wasn’t actually very hard to find something. After reading several recipes, I mixed a few and came out with my own version and let me tell you – it was a total success! The first try was already great and the second and third time I’ve made these polenta chips was only to make sure that they really are so easily made and fool-proof, if I can say so. I spiced them differently every time: once with salt and smoked pepper, once with salt and garlic powder and once with salt and sweet paprika. I liked all three version, but the paprika one was our favorite. The only thing you have to pay special attention to is to spread the polenta as thinly and evenly as possible. The chips have to be really thin to become nice and crispy and they all have to have the same thickness in order to cook simultaneously. Otherwise the thinner ones will become too dark, before the thicker ones are ready. Just to make sure, check them before the cooking time is over and remove those that are ready before the cooking time is over. I had to do that with some of my chips. 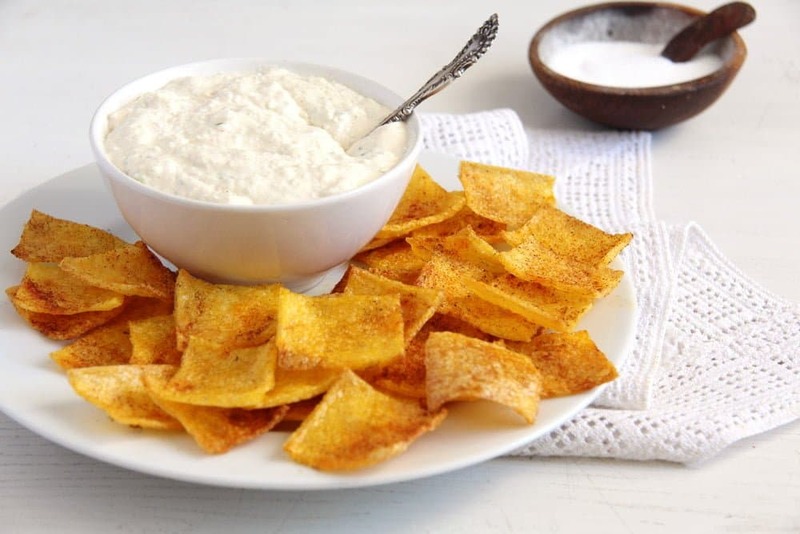 I love these polenta chips just as they are, the little oil and spices make them absolutely delicious, but you can serve them with a dip if you like, just like real tortilla chips. We had them with a feta and cream cheese dip once, which was a perfect fit. 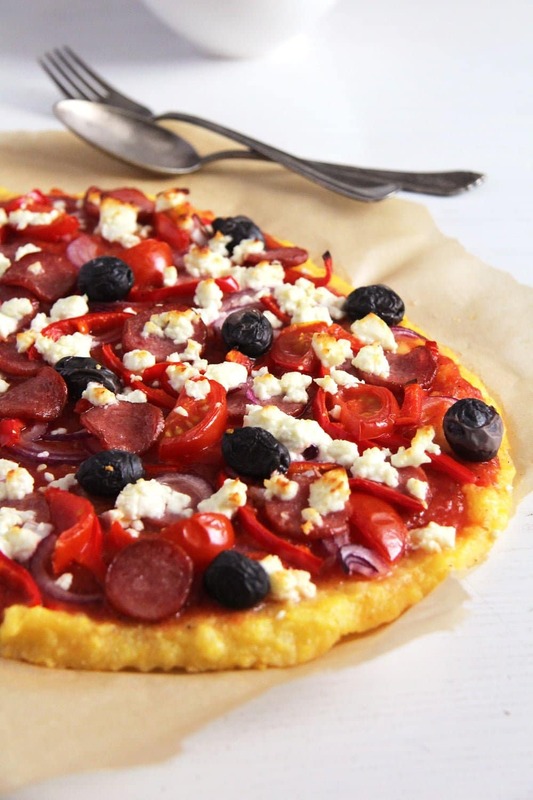 Start by making a basic polenta. Pour the water into a large pot. Heat the water but don't let it come to a boil (it helps against the formation of lumps). Add the salt. Slowly add the cornmeal while stirring or whisking (with an egg beater not a mixer) all the time. A word of caution - be careful when the polenta starts to bubble, if the bubbles are too big you might get burned – so turn the heat down if that happens. When all the cornmeal is incorporated, continue stirring or whisking shortly to make sure there are no lumps. Turn the heat down, place a lid on top but leave a crack open. Stir every 4-5 minutes or so but there is definitely no need to stir all the time. Cook the polenta for only 10 minutes in this case. Place a large piece of baking paper (42 x38 cm/ 16.5x15 inch) on the working surface. Cut another piece of baking paper that is just as large as the first one. Pour the hot polenta in the middle of the first sheet of baking paper, spread it roughly around with a spoon and cover it with the second sheet of baking paper. Roll out the polenta very thinly and evenly using a rolling pin. Make sure that the polenta layer is just as thin in the middle as it is at the edges. Leave the polenta to get completely cold. Preheat the oven to 200 degrees Celsius/ 400 degrees Fahrenheit. Line two baking sheets with fresh baking paper. 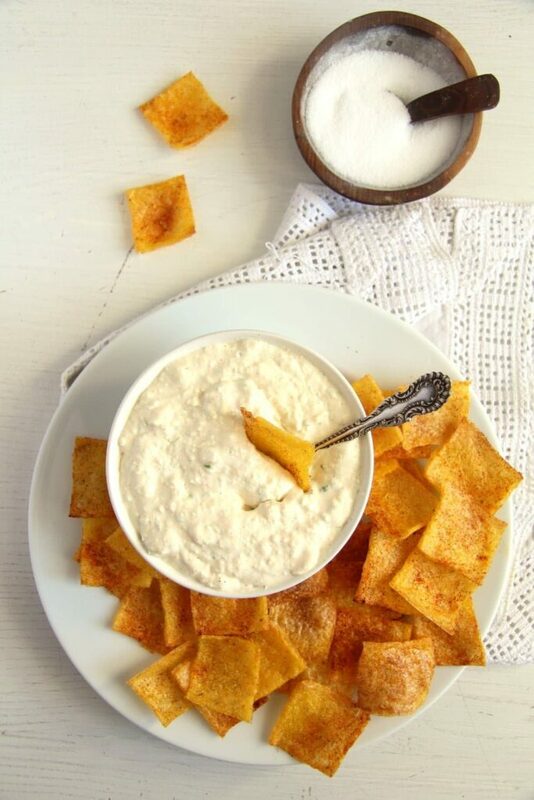 Enjoy plain or with your favorite dip. The minute I read the title of this recipe my mouth started to water! 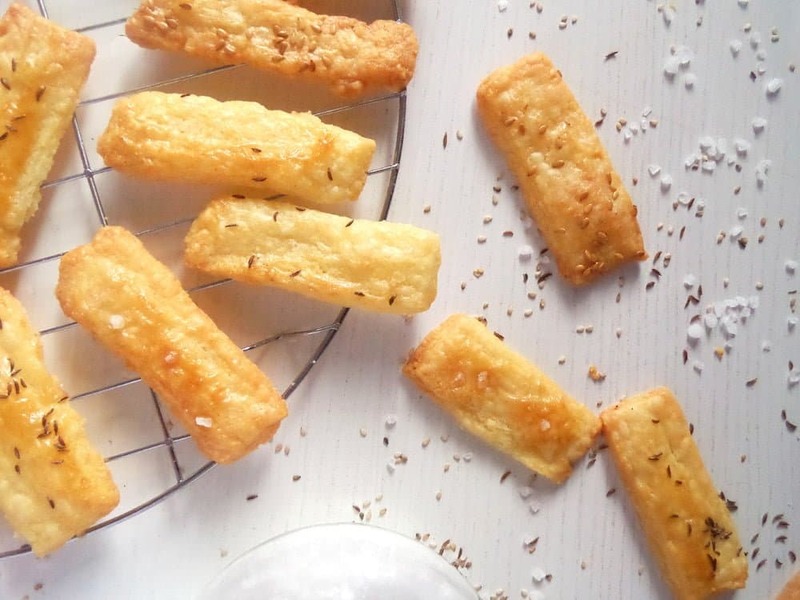 I love polenta, and the idea of making chips out of them is just plain genius!! I usually don’t touch chips, but will definitely make an exception for those beautiful homemade polenta chips! Wow! 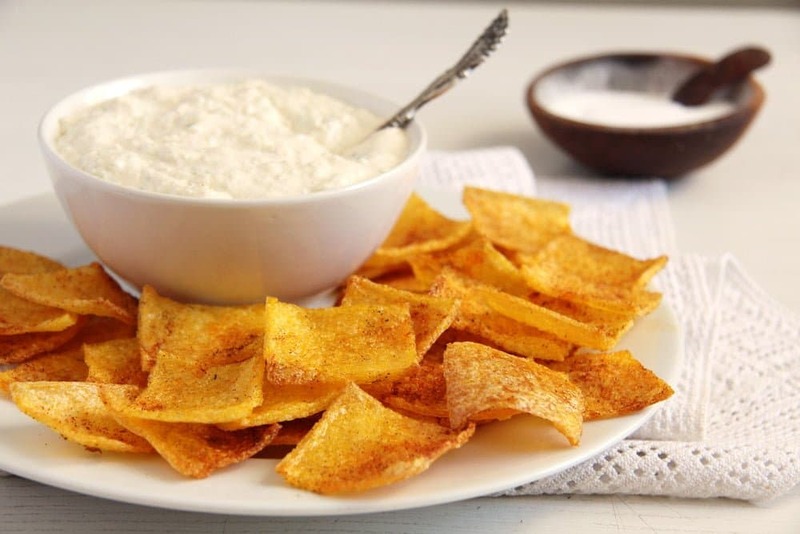 Polenta chips is something I have never tried, and your recipe sounds easy and delicious. Would love to give it a go. Oh I absolutely adore polenta! 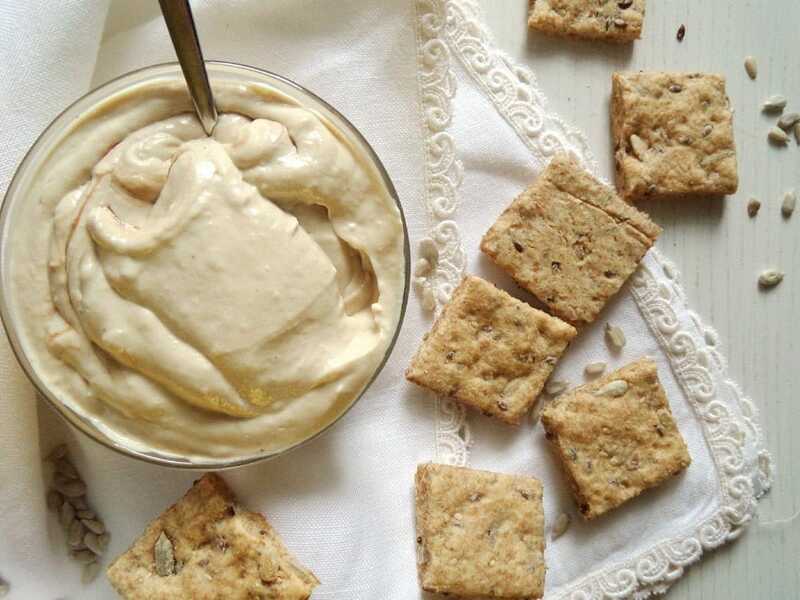 Creamy or as a base for appetizers or as fries – love it. But CHIPS!? GENIUS!!! This is so original and looks just delicious! Can’t wait to try it! Cheers! Have never ever tried polenta chips and I will make sure to have them soon. They looks fantastic! I’m definitely saving this recipe!!! I’m sure my husband would love these chips, they look so crispy! This is fascinating! I have never seen the idea of making polenta chips and they look so wonderfully crisp! Looks really delicious. Great job! I love this Polenta Chips recipe here. Hi Katherine, I am ok with it. This recipe looks great. Could I make them a day or two ahead of time? Hi David. I am not sure, they never last more than a day here, but I suppose that if you keep them airtight they should be ok.
Has anyone in the comments actually MADE these? Would Love to know. This looks really interesting. Finding a replacement for chips and crackers has been very difficult since I can’t eat wheat, gluten, corn, corn dirivitives (commercial citric acid for one), yeast, nearly all processed oils (I have one brand my body will tolerate), and I’m deathly allergic to baking soda (sends me into anaphylactic shock from as little as 1/32 of a teaspoon. -___-) Saying all that it sounds like I shouldn’t have this recipe at all. But I have successfully made ‘polenta’ from home ground garbanzo flour (I’ve heard it called chickpea tofu by a Japanese cook. LOL! The texture is exceedingly like polenta, not watery tofu.) So I started to wonder if it was possible to make it into crackers since polenta is widely versatile. So thank you for this recipe. With my insane food restrictions it is very rare for me to find a recipe where I simply have to substitute ingredients for my identical, but safe, replacements. I hope to try it soon.